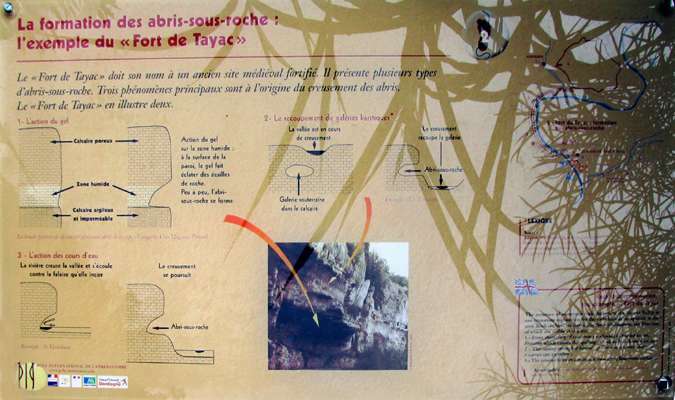 Fort de Tayac has often served as a refuge in times of war, and has been used since the Middle Ages. Fort de Tayac or Roc de Tayac has been used since the Middle Ages, and often served as a refuge in times of war. 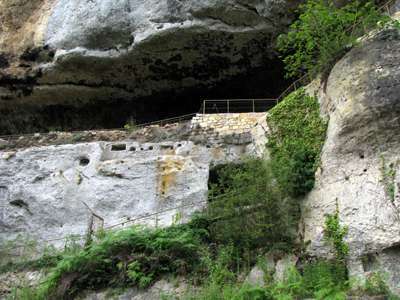 The Roc de Tayac is a much older fortress than the chateau of Les Eyzies (1581) near Dardé’s (1931) statue of Neandertal man. 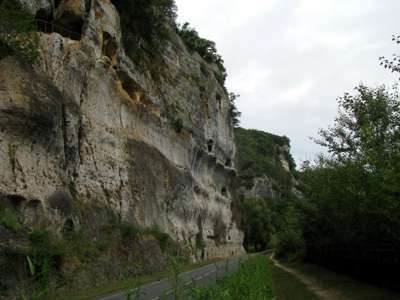 In 1322 Adhémar de Beynac established a tollpost there to control the river traffic on the Vézère which passed beneath the huge cliff on the NE side of the plateau of Le Bil. 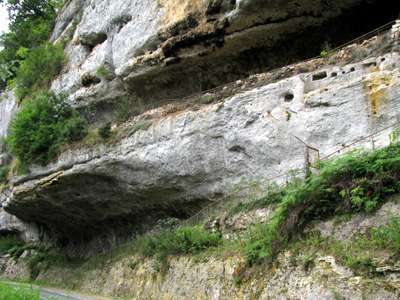 Over time the holes and natural cavities in the cliff were enlarged into rooms and cluzeaux, and were connected by terraces and wooden footbridges. During the Hundred Years War armed English troops occupied the Roc. From around 1370 onwards they extracted money and goods from people passing through the region and acted as bands of highwaymen. The Royal French armies besieged the fortress and it fell in 1382; prisoners were taken and later freed for a large ransom. However, these brigands regrouped and re-occupied the Roc for another couple of decades. The same thing happened after they were besieged and defeated in 1407! 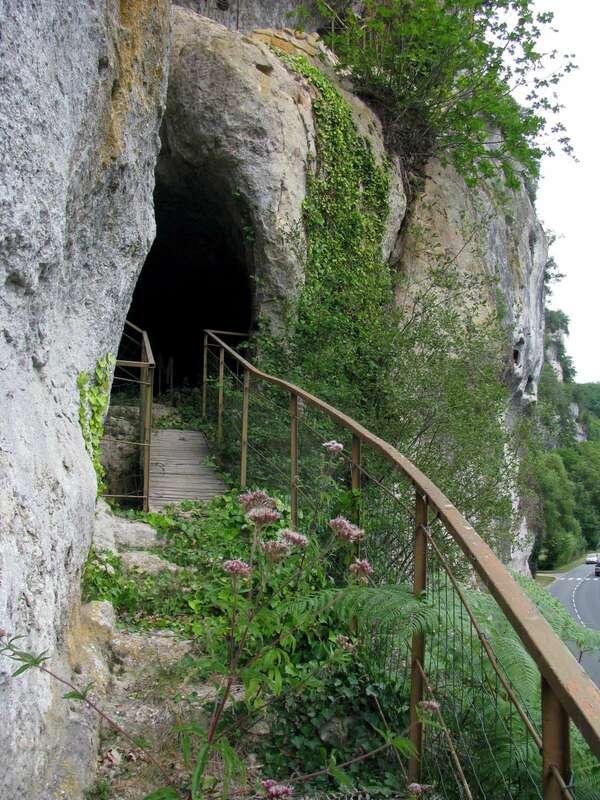 The reign of the English brigands finally came to an end when Lieutenant Bonnehaut, supported by the inhabitants of Sarlat, set siege to the Roc de Tayac on 4th December 1409 and successfully assaulted the weakened occupants on 10th January 1410. This time they destroyed the fort and it was never rebuilt. That is until Gabriel Galou opened a little hotel called the 'Inn of Paradise', now closed, with a bar and restaurant high up on the Roc in the later 19th century. 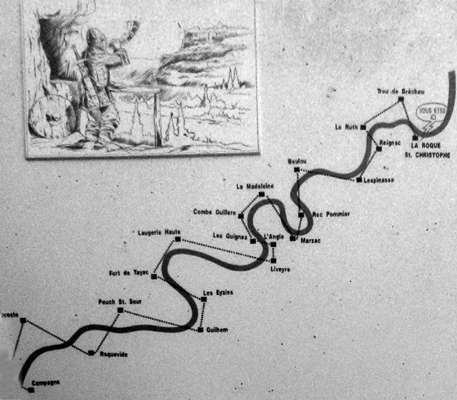 Map of sites in the Vézère Valley of France, including Fort de Tayac. Fort de Tayac was part of a system of watchmen on clifftops along the Vezere Valley who maintained a watch for enemy troops during the Middle Ages. This is a diagram of the main such system along the Vezere valley, on an information board at Roque Saint-Christophe. The watchmen, installed in these (often cramped) booths on the cliffs, signalled up and down the valley of any approach along the river of prospective enemies. This system was rediscovered and an experiment was performed in 1963 by a team of 22 people who moved into these holes in the cliff to watch and listen. 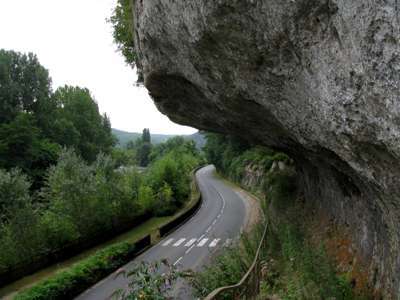 A message sent from Campagne (18 km downstream) arrived at Roque Saint-Christophe in less than 6 minutes, thanks to the signals relayed by hunting horns. I was able to get as far as a locked gate, and take this picture of the continuation of the ledge through the gate. I am unsure whether the porch of the abri was removed in order to make the road beside the Vezere River. That is what it looked like to me. 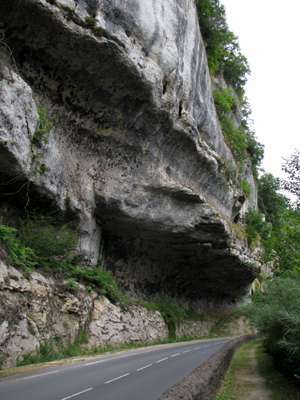 From the other side of the road, many ledges higher up are visible, and most have fences, indicating that there are many habitable areas in the cliff. 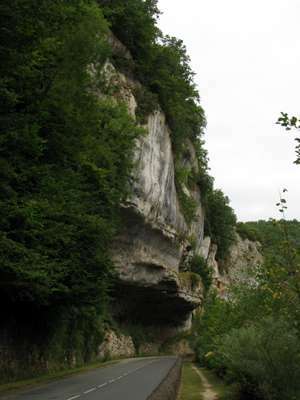 There appear to be extensive flat ledges protected by overhanging rock. Some have been improved with stone walls and back filling to make a more commodious dwelling, and provide more living space. 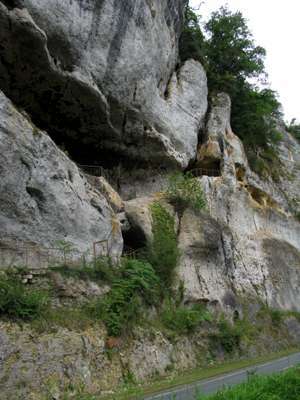 The holes drilled or carved in the rock once held large baulks of timber for the roofs of dwellings on the cliff. This was a very interesting information board about the formation of rock shelters or abris.